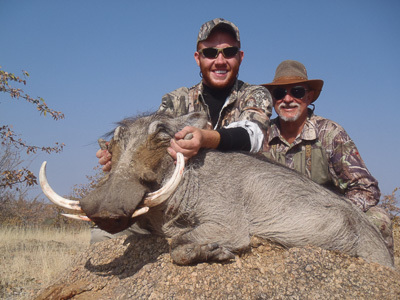 When Levi Hulsey added Warthog to his want list he did not envision that he would take the largest one taken in Namibia in many years. Lady Luck sometimes smiles on those invading the red stands of Africa for the first time. The story begins while relaxing after arriving at Shona Hunting Adventures beautiful main lodge. The lodge, named Tualuka, is situated on the banks of the HuabRiver in north central Namibia. The non-perennial HuabRiver runs through Kaokoland, in the Kunene Region, which is part of the Loxodonta Africana Conservancy. The area is rich with plains game. The owner of Shona and my friend, Johann Veldsman, talked with Levi, my step-son, about what he wanted to accomplish during his 10 day safari. Levi told him he was interested in taking Southern Warthog, Blue Wildebeest, Kalahari Gemsbok and Red Hartebeest in that order. Johann thought that we should start with Warthog. The next morning after breakfast we loaded up and drove to a neighbor’s property to begin the hunt. As we passed though the gate, we ran into the property owner and stopped to talk. He told us that he had been seeing a monster Warthog, which he named the Banana Pig, grazing each morning in one of his pastures. The boar was always accompanied by a large sounder of sows with their off-spring. Being a cattle farmer, he was happy to have pigs removed from the farm and thought the client would be excited to take this exceptional trophy. With the hogs location pin-pointed we drove slowly up to the edge of the pasture and begin to glass. Warthogs were scattered all across the opening, feeding contentedly with a small herd of Springbok. After 30 minutes of glassing without seeing the big boar, we started to drive slowly forward. After we had gone about 300 yards, the Banana Pig exploded out of cover and ran across the road in front of us. The event reminded me of the Road Runner on the carton Wily Coyote. He was sprinting for all that he was worth, leaving a trail of dust behind. There was no time for a shot. As he disappeared in the distance, Johann and I looked at each other with dropped jaws. He was huge. I could not believe that a hog could carry unbroken tusks that big. It was obvious that the hunt for this hog was going to take precedence, but was over for the day. With the boar spooked, we went off in search of Gemsbok. The next morning we went back to the location where we saw the Banana Pig and glassed again. Again we saw nothing. As we drove on, he suddenly broke from cover on the opposite side of the road. He blew out like a marble shot out of a sling shot. Damn!!! He was one smart hog. It appeared that as soon as he heard a vehicle, he would hide in cover until it passed. But he sensed that we were looking because we were driving so slow and stopping often. He would hold tight until the last moment and then break out and head for a small rocky knoll which he would run behind to put cover between himself and the truck. Disappointed and frustrated we left to hunt Blue Wildebeest. Johann decided we needed to give the hog a few days to settle down before we came back. Three days later we came back to hunt the Banana Pig’s haunt again. This time however, we waited until the middle of the day when the boar should be laid up. Johann thought that since the boar had run past the same rocky knoll both times we spooked him, that we should sneak in and take a stand there. He envisioned that he might pass by it again on his way to feed in the evening. We parked the Toyota Safari vehicle a ½ a mile away and slipped quietly into the area. Once in on top of the Knoll we glassed the surrounding area. We saw a Gemsbok quietly feeding within 50 yards, but no Warthogs. We settled in for a long wait. After a while, Johann and Levi stood up to glass again and one of them bumped a stone that rolled off the knoll and then all hell broke loose. A large sow that had been bedded on the back side of the knoll and directly below us panicked and ran. Levi through up his Savage Model 110, but held his fire. A few seconds later, the Banana Pig broke and chased after the sow. Johann screamed Shoot. Shoot, its him! Levi fired a single shot, off-hand and then the two looked at each other in amazement. It happened so fast that I did not have time to get to my feet. As I looked over the rock, I could see a hog lying on his side about a hundred yards out. The 150 grain bullet had done it’s job. The three of us were ecstatic. Some how in those few seconds, Levi had snapped off a shot at a hog running like a scalded dog and had connected. We laughed hugged and slapped backs like school kids. We had done it. Out there on the open ground lay a record book Warthog, the likes of which no one had seen in Northern Namibia for years. We loaded up the boar and headed back to the lodge to show off. Pictures were taken and cold Tafel Lager was broken out. It was a happy day. Looking back, we were very lucky. If the sow that the Banana pig was romancing had not broken and ran, I don’t think the Banana Pig would have exposed himself and would have lived on to frustrate other hunters. The banana Pig is now destined to become a full body mount. Don Roxby has over 50 years of hunting experience and has hunted extensively in the lower Untied States, Canada, and Alaska. Don has expanded his hunting activities to include Africa where he enjoys hunting plains game.